American bird hunters have mixed views when it comes to driven shooting. To some, such shooting evokes scenes of the lord of the manor and his wealthy friends slaughtering hundreds of birds driven over them (and picked up) by the estate workers. Shades of “The Shooting Party” (the book or the movie). Too much of a high-class/low-class thing and not enough “hunt” involved. And how difficult can it be to kill big pheasants that fly right over your head? The first part of the above image is pretty much the way it was a century or so ago. But even in Europe, with the disappearance of the landed gentry, driven shooting has changed. Several years ago I participated in a driven shoot in Scotland. I learned that the beaters (who drive the birds over the guns) and the pickers-up (who collect the shot birds), although they receive nominal pay for their efforts, are virtually all dog enthusiasts drawn to the sport by the opportunities their dogs have to find, flush and retrieve lots of birds. And with few exceptions, today’s European driven shoots are run as businesses, not as social events where wealthy landowners entertain rich friends one weekend and in turn are entertained the next. As a Midwestern pheasant hunter, I’ve had some experience shooting “driven” birds when I’ve played “blocker” as a line of hunters has advanced through a field. (Most of the time, however, because I have a dog, I’m more likely to be one of the guys pushing the birds toward the blockers.) Although those shots can be challenging, one of the major issues is making sure the birds are high enough so you aren’t sending a load of No. 6s at the oncoming hunters. Likewise, the drivers need to make sure they don’t take low chances in the blockers’ directions. That can’t be that hard, I thought. As it turned out, however, Mitchell knew of what he spoke. But the one factor that tends to deter many Americans from driven shooting is cost. Overseas driven shoots are expensive. And, of course, on top of paying for the shooting, there’s the cost of getting there and back. One alternative is the driven shoots offered by several operations in the US. Through the years I’d heard mixed reviews about these but, having acquired a pair of British doubles since my Scottish experience and wanting to use them for their intended purpose, I resolved to try a shoot if I felt it would measure up. That opportunity afforded itself when I received a notification that Harpole’s Heartland Lodge, in Illinois, was offering driven shoots. 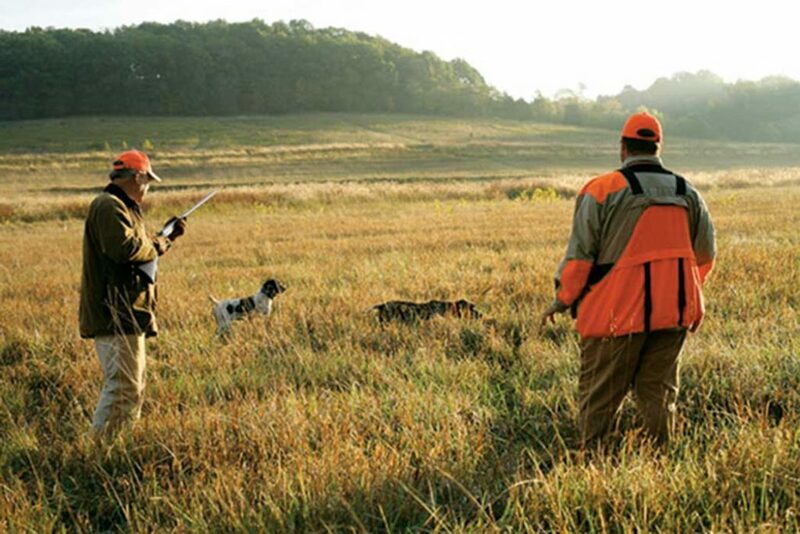 I’d bird hunted at Heartland twice previously in the traditional manner: over pointing dogs. Both experiences had been very positive. I knew that the business was a class operation, and I was convinced that owner Gary Harpole would put on a good show. I also remembered that Heartland has steep hills and plenty of trees—features that would lend themselves to driven shooting. After speaking with Harpole about how he runs his shoots, I made the commitment. My friend Mike Carroll, who had served as my loader several times in “flurry” events at the Upper Peninsula Side by Side Classic, agreed to come along in that capacity. Much of the success of a driven shoot depends on putting together a congenial group, or “line of Guns” as it’s traditionally known. In this case Mark Hinkle of Danville, Illinois, organized the shooting party. All members of the group were friends and/or relatives from Illinois and Missouri. The day before the shoot we met at Heartland Lodge for a late-afternoon tune-up. 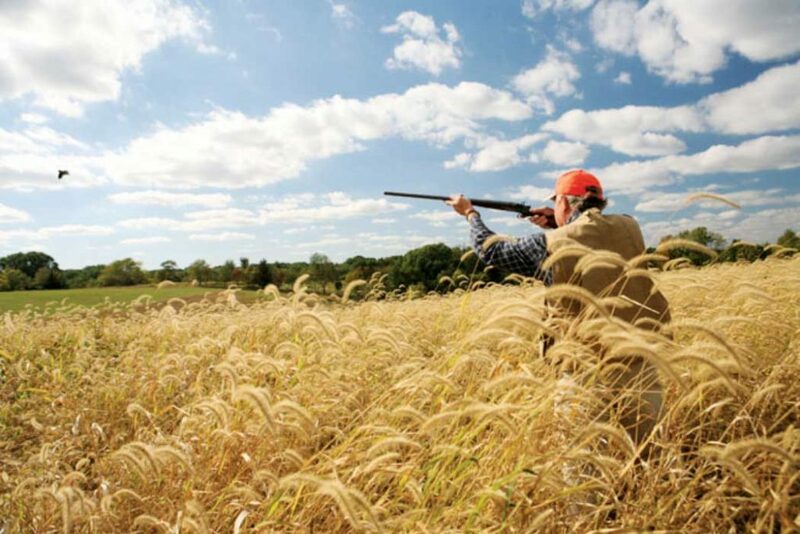 Harpole’s upland manager, Terry Abney, had put together a reasonable introduction to driven shooting using part of Heartland’s sporting clays course. Abney lined up 11 of us at the bottom of a hill and then, using multiple traps, threw rapid-fire clays over the line. Everyone soon got into the swing of it. Every few minutes we switched pegs, or shooting positions, just as we would have on successive drives on a driven shoot. Watching the others between my own shots, I realized that the pheasants would have to fly high and fast if they were to make it past us. I did point out, however, that pheasants likely would be gaining both altitude and speed as they approached rather than slowing and dropping like clays. The next morning we woke to clear skies, calm winds and cool temperatures. After fortifying ourselves with a hearty breakfast in the dining room, we departed in a multi-vehicle caravan to the shoot venue. Abney had positioned six pegs at the bottom of a hill higher than the one from which they’d thrown clays the previous afternoon. The pegs were marked by bales of straw spaced 25 to 30 yards apart, and there were to be two Guns to a peg—although I was shooting solo, seeing as I’d be working with Mike as my loader. Abney advised that there would be multiple releases and that after each we would move one peg to the right. On a European driven shoot each drive takes place in a different location. That’s because instead of liberating birds from a fixed point, the beaters are driving birds that have been in the wild for some time. The head gamekeeper knows which areas are holding birds and chooses the location for each drive accordingly. The Guns still rotate pegs at each drive even though the drives are in different locations. At Heartland this rotation was even more important, as it quickly became apparent that the birds were favoring certain escape routes. Mike and I started in the center of the line. As the birds flushed off of the hilltop, it often would appear that they were coming our way. I’d anticipate a shot, often to have my chosen target veer one way or the other while still out of range, providing a much better shot to the Guns on my right or left. But all the pegs, including mine, were getting some action. The morning’s driven shoot was followed by a walk-up hunt with dogs for the escaped pheasants and some bonus quail. Abney had positioned our line directly in front of a stream, and the tall trees bordering it caused the approaching birds to gain elevation in anticipation of clearing them—assuming they made it past the Guns. And some certainly did make it, particularly on the first drive. But as the group got more used to the high incoming shots on successive drives, fewer and fewer birds made it over. More escaped by going around one end of the line. And a few totally refused to cooperate, flying back in the opposite direction. It quickly became apparent that the action, although steady, was not so fast that I really needed Mike to load and pass me my second gun. Instead he began roaming the line taking photos. 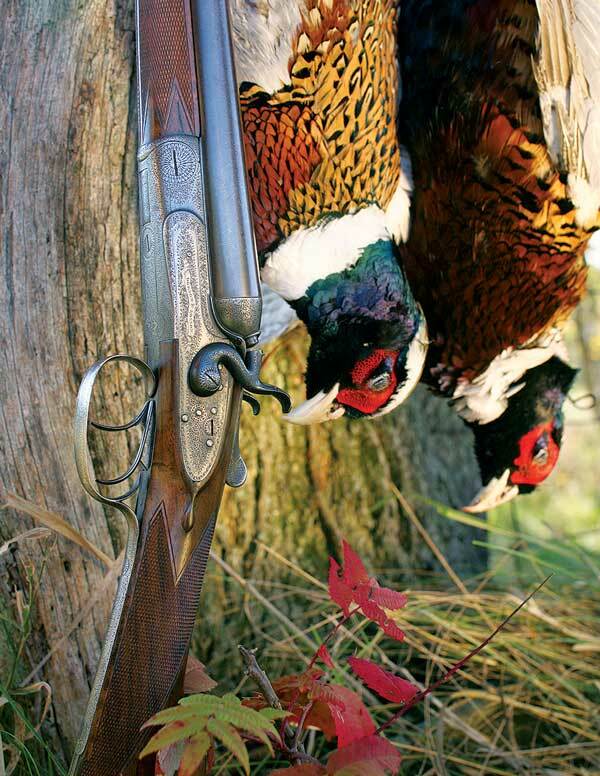 I did keep my second gun ready, however, leaning it against the straw bales, and on a couple of occasions I emptied both guns in a brief flurry of action—though I can’t report the results were four dead birds for four shots. When I was on the right end of the line, I told Mike to put down his camera and pick up one of my guns. Birds were curling around our end with some regularity, and I knew that we’d have a fair amount of action. Mike is a lefty, and my guns are stocked cast-off for a right-handed shooter. Nevertheless he managed to drop a couple of pheasants. On the fifth and final drive I was on the far left end. I was anticipating a lot of shooting again. The other Guns were not yet into action when the first bird came screaming off the hilltop to my left. I was not far enough in front and treated the rest of the group to a clean miss. A few more pheasants dropped to their shots in what turned out to be only a brief bit of action, as we were nearly out of birds. That miss was my only opportunity until the last pair of the day opted to come my way, again well off to my left. Remembering my last miss, I gave the first bird more lead and folded him hard. By that time the trailing bird was nearly in the trees, and I decided not to press my luck. When Abney and his crew gathered the downed birds and lined them up, we found that we had collected 147 pheasants. We’d seen 400, but of that total I’d estimated that about 100 either had flown wide enough around the line to completely avoid the Guns or had flown back in the opposite direction. We’d killed about 50 percent of the birds that actually had come within reasonable shooting range. It had been a very solid showing, certainly aided by the fact that the pegs were quite close together and that there were two Guns at each station. All of the shooters had had fun harassing each other when one would miss and the other would score as the backup Gun. Similarly, a bit of “poaching” had occurred when the occasional bird had approached within range of two different pegs. But that’s all part of the fun of a driven shoot. We returned to the lodge for lunch, and I took the opportunity to change from my traditional British shooting kit—grouse helmet, wool vest over a sweater and tie, and Wellies (I wore corduroy trousers rather than the classic breeks)—into something more appropriate for the afternoon’s activities. Abney had located the driven shoot so that most of the birds that escaped would find only temporary respite. The afternoon would involve dividing up into groups of two or three with a guide and dogs and walking up the survivors. The temperature also had warmed enough that my morning’s outfit, which had been quite comfortable, would have left me significantly overdressed—and without hunter orange—for the afternoon. After a filling lunch and a rest at the lodge, we returned to the fields surrounding the morning’s shoot. For three others and me, the start of the afternoon was somewhat similar to the morning’s activities. We were positioned as blockers at the bottom of a long tree-lined waterway. Abney and his crew figured that quite a few of the morning’s escapees had taken refuge there. They were right. As the two blockers deployed to the far side of the creek, a pair of roosters flushed. One made good his escape; the other did not. Shortly thereafter, we spotted hunters and dogs working down either side of the waterway toward us. We also observed several pheasants running ahead of them and ducking into the sheltered creek banks. The dogs rousted those birds effectively, and my first opportunity came on a rooster sailing high and almost overhead. When I folded him, he nearly dropped on Mike, who was stationed 20 yards behind me with his camera. One bird to my left fared better when his speed proved too great for my lead. My final chance came on a pair of roosters cutting across in front. I dropped the lead bird, but as I swung to complete the double, Ken Burkhamer, next in line to my right, folded the second cleanly into a ditch. When the other hunters, guides and dogs reached us, we reorganized and split into smaller groups. Mark Hinkle and I were with guide Roger Keller and his two pointers, Emma and Dolly. I also had brought my Brittany, Diesel. Following a short drive, we released the dogs in a large field containing food plots and grass with another section of the tree-lined stream at the bottom. We hadn’t gone 100 yards when a rooster flushed wild from left to right. I tumbled it, and Diesel raced to the retrieve. That turned out to be pretty much the extent of Diesel’s work for the day. Dolly was having her first heat, and the object of Diesel’s desire soon changed from birds to Dolly. I exiled him to the truck kennel, from which he would emit the occasional howl of protest. In addition to the refugee pheasants, Abney had put out a few dozen quail. So when one or the other of Keller’s classy charges locked up, we never knew what to expect. On one occasion Hinkle dropped into the ditch to flush whatever the dogs had found. He was out of my line of sight, but I had a good view when he dropped a rooster rocketing up through the trees. A second rooster followed almost immediately, and Hinkle dropped him as well. “I didn’t even have time to reload on that one!” he said as he scrambled proudly up the bank. My best shot of the afternoon came on a single quail that was huddled on the far side of a fence. Emma stuck it from my side and then relocated by running down the fence to a low spot and around to the other side. About the time she pointed again, the bobwhite had had enough. It shot past me and headed across an open field. I had to corkscrew around, but I was lucky enough to connect. By the end of the afternoon the entire group had added another 90 pheasants and 45 quail to our total. It had indeed been a successful day, with everyone involved getting plenty of shooting at both driven and walked-up birds. In fact, when Mark Hinkle took a quick poll to see who’d be interested in a repeat performance the following year, the response was unanimous. At least with this group of typical American bird hunters, driven shooting was a big hit. For more information on driven shooting, contact Heartland Lodge, 800-717-4868 or 217-734-2526.